The array sensor is composed of Indium Gallium Arsenide (InGaAs). The sensitivity bandwidth is comprised between 0.9 and 1.7 µm. This technology is integrated in imaging systems such as WiDy and SC2500 cameras produced by NIT and FLIR (Cf. Figure 2). The SWIR imaging is used in perimeter surveillance for seeing through fog, haze, dust and smoke. This technology provides also a strong visibility at dusk and dawn hours. Another interesting point is that the phenomenon of nightglow, which is a very weak emission of light in the upper atmosphere, is more radiant in SWIR spectrum. 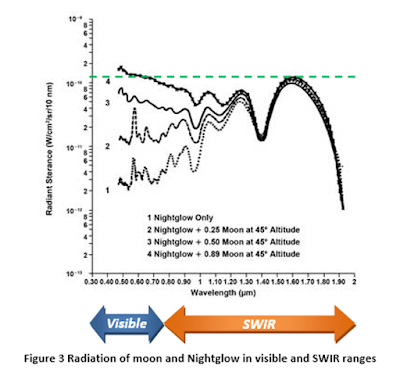 As shows in Figure 3, the maximum radiant of nightglow in SWIR spectrum is similar at the radiant measured at 0.5 µm in visible spectrum during a night with a full moon visible at 89%. Concerning video analytics, SWIR imaging allows detection, recognition and identification of objects and persons. As shows in Figure 4, the visage is still reflective in SWIR spectrum. Differences in appearance between the visible and SWIR images are due to reflective material properties. For example, hairs are more reflective in SWIR spectrum. 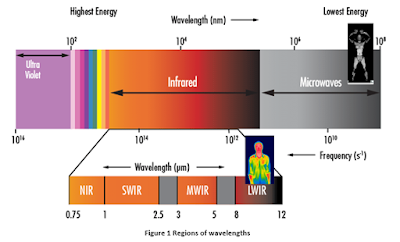 Most of glasses are also transparent in SWIR spectrum unlike MWIR and LWIR spectra. In conclusion, SWIR imaging allows using algorithms designed for analyzing visible images . Two tests were realized in Palaiseau in October, 2015, in THALES Research & Technology for testing the visibility through the fog with a SWIR camera at indoor and outdoor conditions. In this work, the fog was simulated by machines. The artificial fog is composed of 65% of water, 25% of glycol and 2% of glycerin. The results are presented below. This test was done at indoor in a room of 15m2. Visible and SWIR streams were recorded from both cameras: AXIS P1346 and FLIR SC2500. A high-pass filter was added to the optical system of the FLIR camera for selecting the wavelengths comprised between 0.8 and 2.5µm. The duration of test is nine minutes. For this test, we used a fog machine which can produce 40m3 of artificial fog per minute. We observe in Figure 5 that the person disappears in the fog in the visible image while the same person is still visible in the SWIR image (2). This test was done at outdoor in a garden composed of trees, grass and one path. Visible, SWIR and IR streams were recorded from both cameras: AXIS and FLIR SC2500. A pass-band filter was added to the optical system of the FLIR camera for selecting the spectrum centered at wavelength around 1.6 µm. The duration of test is 30 minutes. For this test, we used a fog machine which can produce 1000m3 of artificial fog per minute. 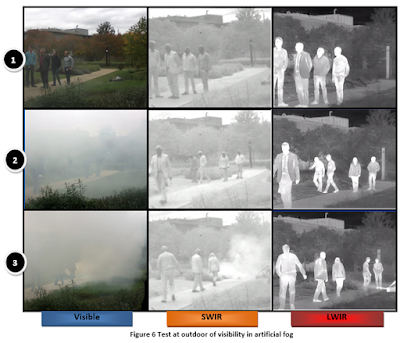 We observe in Figure 6 that the persons are only detectable in SWIR and IR images in presence of artificial fog (2). Moreover, if the artificial fog is too dense (3), the two persons in the background are only detectable in IR image (3). These results are in agreement with previous works . As presented in the theoretical part, an array sensor, composed of InGaAs, could produce images of a scene with poor visibility such as a scene with haze, fog and smoke. The nightglow phenomenon allows also producing an image by night. 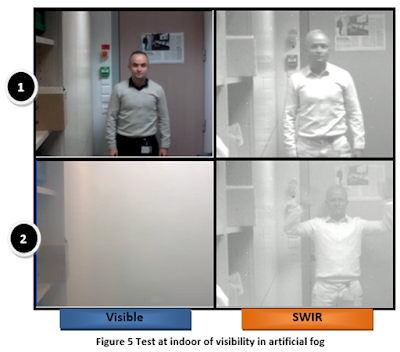 In video analytics, the SWIR imaging has advantages for extracting and locating features by using algorithms designed for visible spectrum. The experimentations, realized in October, 2015, show that persons are still detectable through artificial fog at indoor and outdoor conditions. A future experimentation would consist in generating images in SWIR spectrum of scenes with smoke in real conditions. This technology could be used by the firefighters for seeing through the smoke during an intervention. T. Lamarque and C. Le Barz. “Video Surveillance Cameras”. Intelligent Video Surveillance Systems edited by J-Y Dufour. Chapter 3. 2013. M. K. Bhowmik, K. Saha, S. Majumder, A. Saha, A. N. Sarma, D. Bhattacharjee, D. K. Basu and M. Nasipuri. “Thermal Infrared Face Recognition – A Biometric Identification Technique for Robust Security system”. Reviews, Refinements and New Ideas in Face Recognition. Chapter 6. 2011. B. Göher and P. Lutzmann. “SWIR laser gated viewing at Fraunhofer IOSB”. Electro-Optical Remote, Sensing, Photonic Technologies and Applications IX. Volume 9646. SPIE Security + Defense 2015. September 21-22th, Toulouse, 2015. M. Bertozzi, R. I. Fedriga, A. Miron and J-L. Reverchon. “Pedestrian Detection in Poor Visibility Conditions: Would SWIR Help?”. Image Analysis and Processing. ICIAP 2013. Volume 8157, pp 229-238. 2013. Browse 64 Market Data Tables and 35 Figures spread through 131 Pages and in-depth TOC on "Shortwave Infrared (SWIR) Market - Global Forecast to 2023"